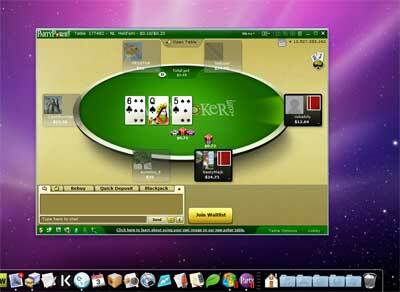 Quick Start: Play at Party Poker on your Mac using the Mac-friendly instant play version now. How do you go about playing Party Poker on a Mac computer? In fact, does Party Poker have a Mac version available? 1) The easiest way - the instant play version. PartyPoker has a handy Java version of their poker room that runs within your browser. This is by far the easiest way to play at Party on your Mac. You just click "play" and the poker room opens in a new window. The good news is that this is one of the better browser-based poker sites out there. The no-download version is quick to load and has all the essential features that a good poker site should have. I've not had any problems running PartyPoker "instant play" in Safari, Firefox or Chrome on my Macbook. This Mac compatible method is perfect if you play poker casually or just want to test the room out. Note: You may need to give permission to your browser to run the Java plugin when playing this instant play version for the first time. This is perfectly normal. Just click "run this time" or something like that and you're good to go. I've included a screenshot below to show you what I mean. If you see a notification or prompt like this just select "okay" or "run". The client will start to load immediately after. 2) The advanced way - running PartyPoker through Parallels or BootCamp. Unfortunately, PartyPoker doesn't offer a native Mac client like some rooms do – so there's no "Party Poker App". The only downloadable client on offer comes in a .exe file, which Macs cannot run. Parallels - Paid - Run Windows programs at the same time as Mac OS X. Boot Camp - Free (comes with you Mac) - Runs Windows instead of Mac OSX when you boot your Mac up. The easiest method is to use Parallels. This is what's technically know as a "PC emulator". There are other emulators on the market like VMware Fusion, but Parallels is by far the easiest and most user-friendly option in my opinion. This emulator method saves you from having to reboot your Mac every time you want to play at Party Poker. The obvious trade-off for this convenience is the fact Parallels has a price tag. I use Parallels myself for using lots of different Windows-only programs (running PokerStove for example), so it's definitely worth looking in to. Screenshot of me playing at Party Poker using Parallels in "Coherence" mode. The other option is to use Boot Camp, which is a tool that comes built in with OS X. The downside is that you can't run Windows and Mac side by side, so that's obviously a bit of a hassle. In all honesty I'd rather just use the instant play version than reboot my computer every time I want to play at Party, but the option is there if you want it. Why run the downloadable Party client on a Mac? Good question. If there's a nice and easy instant play version on offer, why bother with the small extra hassle of running the downloadable .exe version? Because the downloadable version has more features. Basically, the downloadable version a bit more robust. If you're a serious poker player (i.e. you play frequently and/or you like to multi-table) I'd highly recommend looking in to running the main Party Poker client on your Mac. Sure, it takes a little extra time initially to get it all set-up, but once you've got it sorted it's plain sailing from there. I've happily played some big sessions on the browser version for real money in the past, but I just prefer the main download version more. Can I run Party on any Apple computer? It won't work on the smaller apple devices like iPads, iPhones or iPod Touches though. I'm not sure that would be much fun anyway. The only possible difficulty I could imagine 0.1% of people having is running Parallels on older Mac OS X editions. If I'm not wrong you need to be running Mac OS X v10.4 "Tiger" 10.4.11 or later to use Parallels. That came out in 2005 though, so if your apple laptop or desktop is newer than that then it's all good. Note: If you don't know which version of Mac OS X you're running, it's probably going to be Leopard (10.5), Snow Leopard (10.6) or Lion (10.7). They're all fine for running Party Poker. Which browsers can you run PartyPoker in? Occasionally some no download poker sites will work fine in some browsers but not very well in others. However, I'm pleased to report that Party worked impressively across the board. So there's no need to worry about switching browsers for optimal performance. I'm guessing that you'll have no problems with the less popular browsers like SeaMonkey or Flock either. The only browsers that this no download version won't work with is most mobile ones, so that's your iPhone and iPad out of the equation I'm afraid.